We had one of each!! 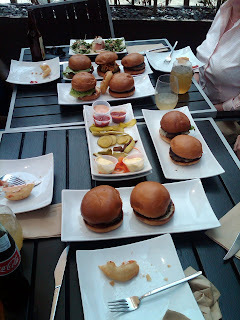 Nine(9)different burgers at the Umami Burger in LA on La Brea. Our favorites included the Umami Burger, the Hatch, and the Triple Pork. The "Pickle" plate had 3 varieties of pickles, pickled carrots, shiitake mushrooms and we all loved the pickled okra. Welcome to the Two Chefs Foodie Blog! The beauty of working for a company named Two Chefs on a Roll is that your world inherently becomes all about food. And our company is filled with people who have a passion for all things food - designing it, creating it, making it, selling it, eating it! We love everything from the sweet to the salty, sour, bitter, umami, thick, thin, hot, cold, comfort food, ethnic, etc. Our group developed a tradition called "Foodie Friday," where we get together and explore restaurants and markets in the LA/OC area. Not a novel concept, per se, but one that gets our team out into the world and the marketplace to taste and try new things, as well as inspire us and get our creative juices flowing. All in the name of "research!" At our last Foodie Friday, we came up with the idea to start this blog as a means to share our experiences from "Foodie Friday." Then, we realized we all love to try new places in our personal lives, as well, and thought this would be a great way to share our ideas, revelations, comments on observed trends, and food experiences. So, straight from the food lovin' Two Chefs team, enjoy our posts.